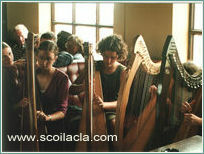 Scoil Acla is a summer school that offers tuition in traditional Irish music, arts and culture. The original Scoil Acla was established in 1910, and the event has been held every year since being revived in 1987. Scoil Acla provides expert tuition in a range of disciplines for people of all ages and abilities. Musical tuition includes the harp, tin whistle, fiddle, concert flute, uileann pipes, banjo and accordion. A writers workshop is provided, as are courses in the visual arts. For full details of the current Scoil Acla schedule, please see the Scoil Acla website. 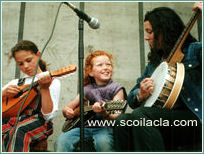 For non-participants, including parents of children taking part in Scoil Acla, there are regular public concerts and performances, including a gala performance on the final day of the summer school. Scoil Acla is a highly regarded traditional Irish summer school, and for visitors it provides an authentic view of traditional Irish arts and culture.